2001: the good old days! 2005: starting to move on! 2008: Ian visits aging aunts . . .
Angela at the Playden Oasts on Rye Hill. One of the pleasures of middle age has been discovering my aging aunts. Taking advantage of the low fares, I spent five February days in England and visited Aunty Vi (Violet Rose Eliza: how’s that for a Dickensian name!) 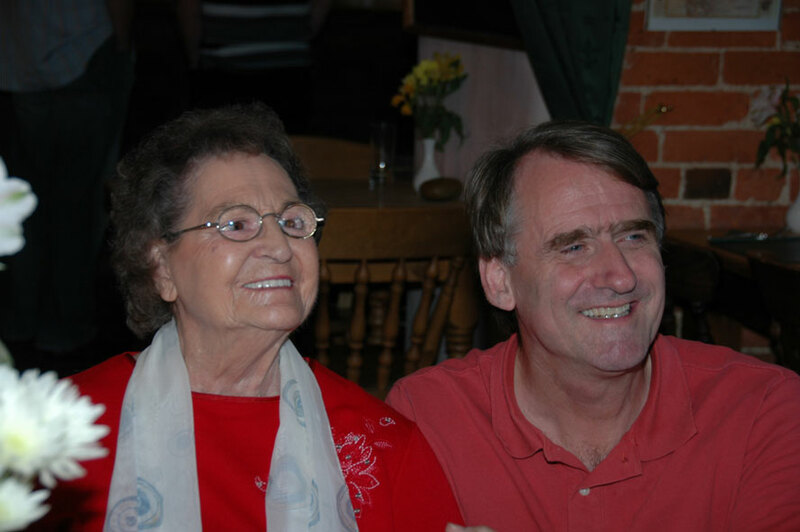 in Solihull, West Midlands and Aunty Angela in Rye, East Sussex. 87 years young, if I remember correctly, Aunt Angela née Stock is not actually an Aunt, although she feels like one. She and I are second cousins thrice removed, or third cousins twice removed, or something of the sort. She almost made it to our wedding: a bit of car trouble delayed the visit two weeks! Walter George Stock’s grave in a cemetery overlooking the old Great Western Railway’s main line to Bristol, South Wales and the Southwest..
During my visit to her home this time, Angela pulled out a receipt for her grandfather’s grave in Swindon, where he (Walter George Stock) had spent his career as an engineer at the Great Western Railway’s Swindon Works. The GWR and then British Railways built steam locomotives at Swindon Works from 1846 until 1960, when the last main-line steam locomotive built in the UK (until 2008) was built there. Named the “Evening Star,” this locomotive made national headlines as it heralded the end of steam locomotives in the UK. I was then an ardent trainspotter, my first hobby, and remember the sadness of that moment on the black and white BBC TV news. Angela’s father was another Walter, this time Walter Harry. She gave me this photo of him during that visit. After visiting Aunt Angela in Rye, I immediately drove around London and down the M4 and found her grandfather Walter’s grave. The Swindon cemetery where he was laid to rest is now all but abandoned, and many of the hundreds of graves have almost disintegrated. But walking around, I stumbled upon his grave, almost literally. I was peering the other way, down toward the valley, and when I turned my head, there was the grave. Walter was buried there with his wife Mary Ann, née Thomas, and two of their children, Victor and William. The poor couple buried two of their own children during their own lifetimes. It was perhaps wishful thinking, because Walter had been an engineer, but this grave seemed to have been very well put together, as if a good engineer had thought through the design himself. In any event, it was in good condition considering that it has probably fended for itself for fifty or sixty years. Angela lives a long way away, and her children even further. My great-great-grandfather’s former home near Paddington. Walter George Stock was Thomas Charles Stock’s younger brother. Thomas was my great-great-grandfather (that’s right, Angela’s grandfather was my great great grandfather’s younger brother). 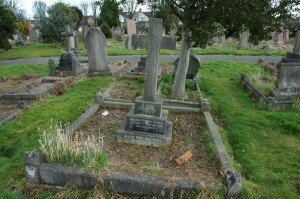 Thomas’ grave in Paddington Cemetery in London can be seen with his young namesake on the “young Tom” page. 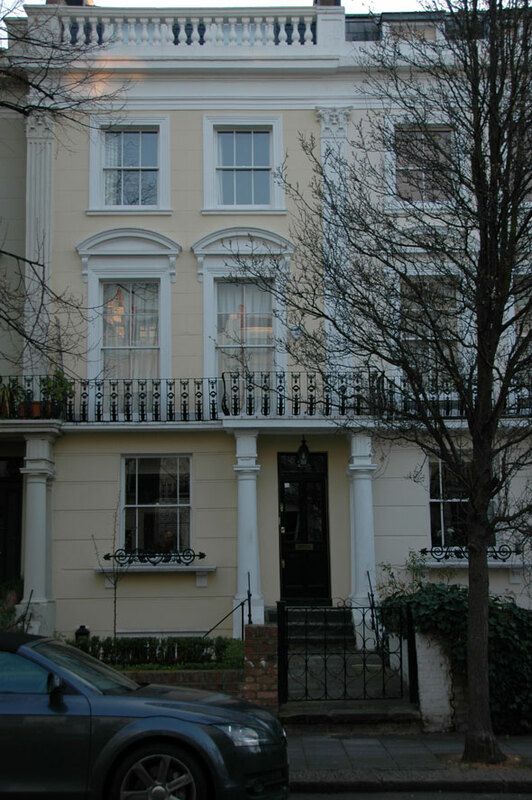 Earlier during the trip, I drove to the house on the right, 23 Sutherland Place, London W2, the former home of said Thomas Charles, located in what is now referred to as Notting Hill. Angela remembers visiting this home in the 1920s with her mother and brother Nigel. She said that brother and sister entertained their aunt, uncle and cousins with song and dance, accompanying themselves, I think on the piano. 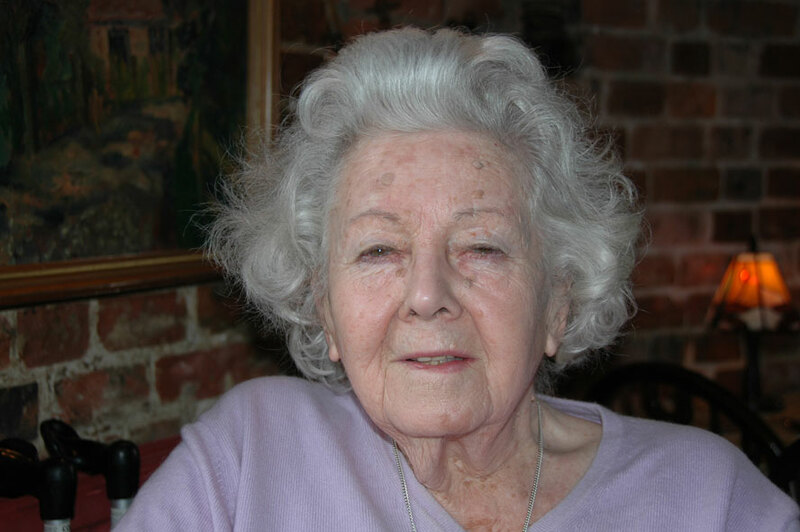 Angela attributed her and her brother’s creative inclinations (both attended RADA) to their mother Maisie (née Munro), who orchestrated these family performances. 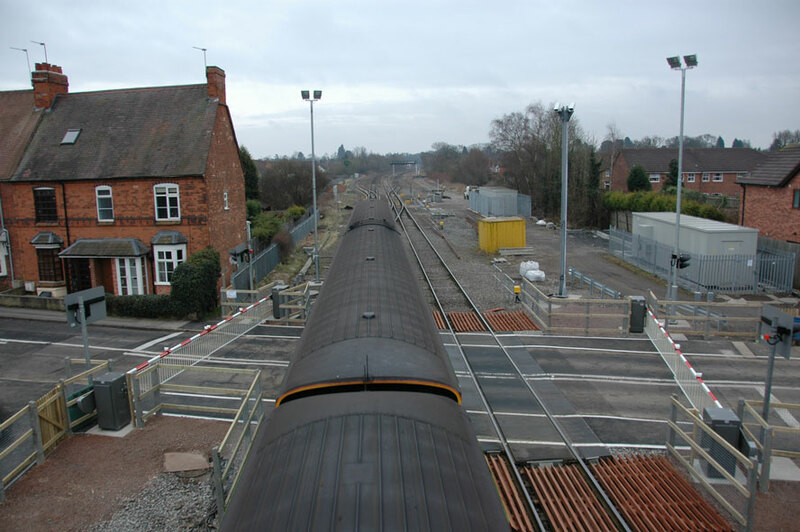 From the footbridge across the railway in Bentley Heath, on the line from Birmingham to Leamington Spa. During this trip, I also visited Aunty Vi née Smith, Grandma Stock’s older sister (yes, she really is my aunt! ), who still lived near where she was raised in Birmingham. I took her for a drive around the city, visiting Grandma’s grave and sights from her past. She is the only surviving Smith sibling, and still the gay Irish girl of her youth. But first I drove by a few of my own memories in the Birmingham area. On the left is the level crossing at Mill Lane in Bentley Heath. We Stocks lived at 85 Mill Lane from 1964 to 1966. The train going by underneath the footbridge will soon stop at Knowle and Dorridge station, our local station during those years. Our house was only about half a mile from the level crossing. As an eager trainspotter, I was delighted to live so close to the trains. There were four tracks then. 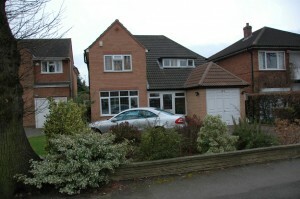 Perhaps the house where Aunty Vi lived with my mum, Uncle Cyril and their mum and dad. 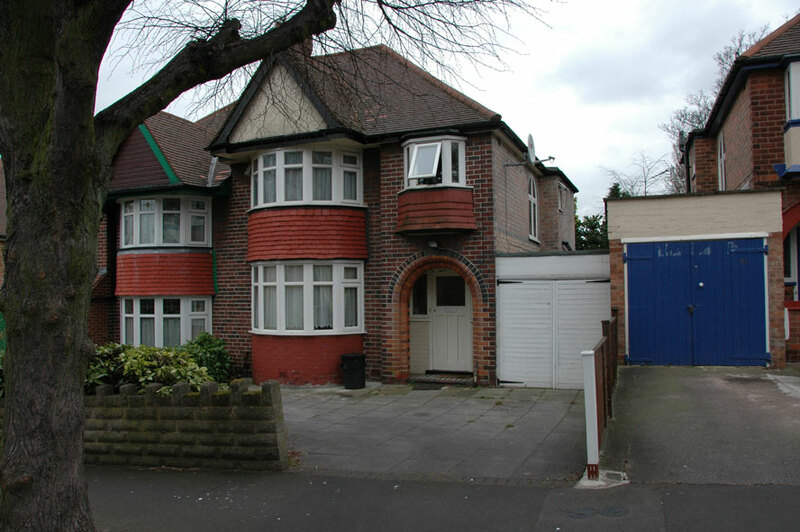 On our drive around the city together, Aunty Vi showed me around the houses she lived in as a girl, and we lunched on Erdington High Street, the shopping center of her childhood. Her father, Frederick Smith, was a painter, what we’d call a contractor nowadays. She said that he was sought after because of his attention to detail. The house on the right was their family’s on Milverton Road. At least, she thought so, but wasn’t entirely sure. She did remember that he bought it new, but not which exact house it was. They all look alike, and it’s been sixty years, after all! Here’s Aunty Vi, in a photo taken the summer before when Marie-Hélène and I took Charlie and Alex to visit her. It was time for lunch in a nice pub. Vi’s son Ron took this one. I have since checked his will, and the house which was sold after he died was 95 Milverton Road. Of course, I don’t know if the numbering system on that road has changed in the meantime. 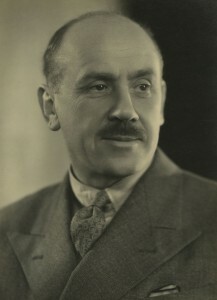 Frederick died in 1944. I also didn’t note the number of this house in the picture. Can’t remember everything! Aunty Vi did remember going with her brother Cyril to watch Aston Villa, one of the stalwarts of English soccer, and getting in free every Saturday because her father was engaged to paint the stands for the Villa. Did he paint in claret and blue? A photo of the adult Smith brother and sisters is here. 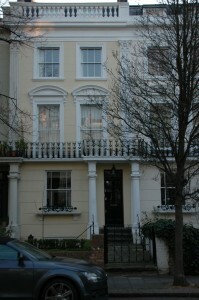 The Stocks’ home from 1964-6. It looks almost the same now. I spent hours kicking a football against the garage door, alternating feet for as long as I could. During the 2008 trip, Aunty Vi and I went to pay their respects to Grandma. 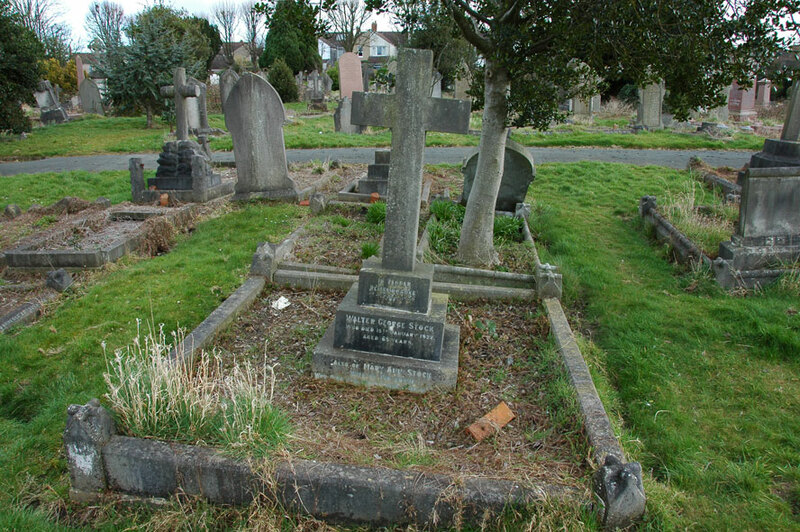 Since there is already a picture of one grave on this page, let’s refer you here, where there is a nice shot of Grandma’s grave in the Abbey, Erdington. As she instructed in her Will, she was buried with her parents. It’s a short walk from the Erdington High Street, where Aunty Vi and I had lunch, to the cemetery, and an even shorter walk from the local train station. The names on the graves prove that it’s an Irish neighborhood, and it still is today. A chap with a broad Irish brogue who works for the parish looks after the grave, well, most of the time. He periodically disappears, and we start to worry. But he keeps coming back! Here are the other 2008 photo journal pages: Tom living in Paris, Alban out and about in Santa Cruz, Maman, Papa, Charlie and Alex taking a long weekend down the California coast, birthdays and other special days in 2008, soccer in 2008, portraits in 2008 and, last but not least, the main 2008 journal page. Aging Gracefully… Most of the Time! How Vicki Parry REALLY screwed up! 2016: how does it feel? 2015: ch- ch- ch- changes! 2014: a great vacation in Europe, and then some! 2012: car crash, court date and colonoscopy! Adventures (mini) in the Sierra Nevada. Tom and Morgane come to town! Copyrights 2017 Ian Stock. All Rights Reserved.